Despite having a polite sign on my contact page saying: No advertisers. Please. I’ve had messages from entities with convincingly human-sounding names like Brad and Susan trying to sell me marijuana bongs, advertising spaces, weight loss products and ab builders. In addition, I’ve had personal emails from people/ bots offering services that will increase my hits. I think the word for what we all feel when we encounter this kind of spam is IRRITATION. With regard to the latter, may I just add here, that the last person I’m going to want to do business with is someone (or something) who disregards or can’t read a simple request sitting right in front of them. There. I feel better now I’ve got that off my chest. Speaking of persistent sales people, hustling for business is, of course, as old as civilisation. 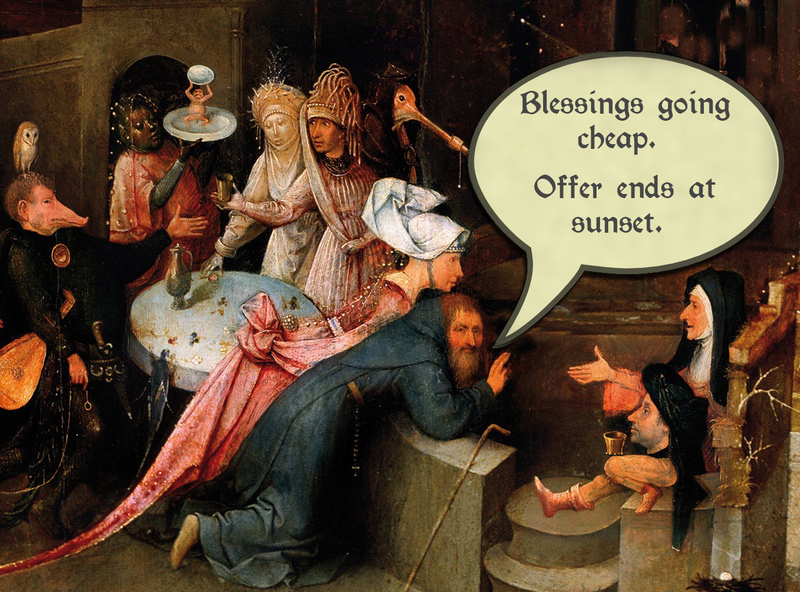 Back in the Middle Ages, people not only sold merchandise but blessings from God. It was one of the reasons the reformation was inevitable. Particularly when the sales people were intoxicated; which rendered them about as sensitive as bots. I open my mouth to decline, but he interrupts. “You look like a woman in need of confesshion,” he slurs. The mist clears for a moment, revealing the tattered hem of his robes, worn sandals, cankered feet and filthy toenails. I blink and rub the tears and drizzle from my cheeks. He steps closer and buzzes around me, as persistent as a blow fly. “Confesshion will unburden you,” he insists. He may be drunk but he’s alert to my trepidation. He puckers his flabby lips. “A cheap confesshion is better than no confesshion,” he replies. “Shpeaking of your illsh, releashing them from the devil’sh grip will eash your pain,” he slurs, “and bring you closher to our Lord.” He punctuates this last exhortation with another loud belch. Next > Free Will: Is it Real?